De Pere City Hall is located at 335 South Broadway, De Pere, WI 54115; phone: 920-339-4050. Photo: Edwin and Jennie Gutknecht House, ca. 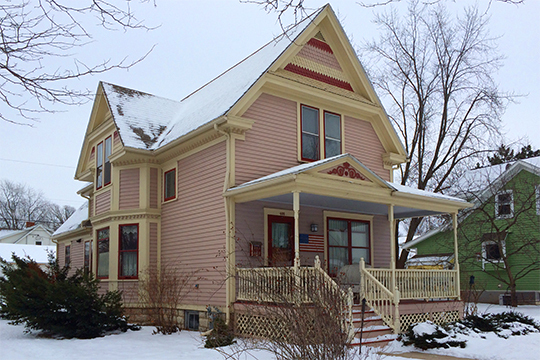 1914, 603 South Michigan Street, De Pere, WI. Listed on the National Register of Historic Places in 2015. Photographed by User:Jon Roanhaus (own work), 2015, cc-by-3.0 (creativecommons.org/licenses/by/3.0)], via Wikimedia Commons, accessed November, 2015. De Pere was incorporated as a village March 6, 1857, although the first plat of the town was made under authority of the De Pere Hydraulic Company in 1835. In 1837 De Pere became the county seat and a courthouse was built on the northeast corner of Wisconsin and George Streets. The seat of government was moved to Green Bay when it was incorporated in 1854.